Douglas William Sutherland was born on 23 September 1932, one of a large Catholic family. He was unmarried. During his mayoralty, his long-time companion and accountant Patricia Feodosiu, the daughter of Russian immigrants, acted as Lady Mayoress. Doug Sutherland was educated at St Patrick’s College at Strathfield, Sydney, and at Macquarie University,Sydney. He became a certified practising accountant from 1958. He is a Fellow of the Institute of Chartered Accountants of Australia, theInstituteofChartered Secretariesand Administrators, and the Australian Society of Accountants. Sutherland was a member of theCumberland,Newcastleand Wollongong Board of Appeal Panel, 1969-72 and also a member of the Local Government Appeals Tribunal, 1972-8, the Local Government Grants Commission, 1978-84, and the Local Government Clerks and Auditors Examination Committee, 1968. He was President of the Local Government Association of NSW 1981-83. In 1991 he was appointed an Inaugural Board Member of Sydney Electricity. He was elected to the Board of the NRMA on 1 December 2001. He is also a Director of Minerals Corporation Ltd.
Sutherland has been the patron of many organisations including Parents without Partners, the Smith Family, Red Cross Calling Appeals, and the Highland Society of NSW. He is a life governor of the Benevolent Society of NSW and a life member of the Sydney City Mission and the Glebe Rowing Club. He was president of the Sydney Harbour Dragon Boat Races and the Sydney International Piano Competition. In January 1986 he was appointed chairman of the Sydney Swans football club. Sutherland was made a Member of the Order of Australia in 1979 for services to local government. Douglas Sutherland was an Alderman of Burwood Municipal Council from 1959 to 1974, serving as Mayor for three terms. He was also an Alderman of Ashfield Municipal Council from 1974 to 1977. Doug Sutherland was elected to Sydney City Council as Alderman for Fitzroy Ward from 17 September 1977 to 26 March 1987 when the Council was replaced by City Commissioners. He was re-elected in 1989 but did not stand in the elections of September 1995. He was a member of the Community Services and City Health Committee from 1977-78 and the Finance Committee and the Properties Committee in 1979. He was also a member of the Joint Steering Committee of the 1984 Biennial Congress of International Union of Local Authorities, the New South Wales Government’s Committee on Inner City Low Income Housing and Related Issues, the Town Hall Advisory Committee, and the City ofSydney Plan Review Committeein 1984. He was Chairman of the Finance and Industrial Relations Committee in 1984. He was a member of the Planning Committee and the Works Committee, 1989-91 and their Deputy Chairman 1989–90. He was a member of the Central Sydney Planning Committee in 1989. 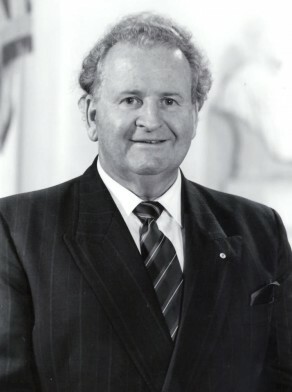 Sutherland was elected Lord Mayor on20 September 1980until26 March 1987when all members of the Council of the City ofSydneywere removed by proclamation. Other committees he was involved with were the Sydney–San Francisco Sister City Committee, the Pitt Street Mall Committee, the Capitol Theatre Committee and the Sydney City Council Access Committee in 1991. Sutherland was also a member of the House Committee and the Housing Sub-Committee of the Planning Committee, 1991–92, the Sydney Cove Redevelopment Authority, 1982-85 and the Metropolitan Water and Sewerage Board, 1963-83. He was a member of the Australian Labor Party when he became Lord Mayor but was sacked by the Labor Government in 1987 and later stood as an Independent.